Aromatherapy Massage Dublin suppliers use essential oils produced by local or international organic farms that comply with the regulations for organic farming, and do not use an agreed set of additives or sprays during the growing period or after. Organic products certified in Ireland must carry the words "Certified Organic" or "Organic Certification" on its label, followed by the code of the certifying body (the Irish Organic Farmers' and Growers' Association); (the Organic Trust); (Demeter Standards Ltd). Aromatherapy Massage Dublin supports those recommendations. The blend and use of different vegetable oils during an aromatherapy massage is valuable. A carrier oil, also referred as fixed oil or base oil is a vegetable oil, less volatile than an essential oil, and therefore more suitable for use as a base. It is derived from the fatty portion of a plant, usually from the seeds, kernels or the nuts and defined as lipids, largely composed of fatty acids. It is worth remembering that essential fatty acids are the precursors of some cell membrane constituents. Therefore, if there is a lack of skin elasticity using oils rich in fatty acids - both internally and topically would be of great benefit. What does an aromatherapy massage involve? Vegetable oil molecules can be absorbed into the blood stream through the pores of the skin. The carrier oil acts as a lubricant between hand and skin in massage, it provides the necessary lubrication to allow the hands to move freely over the skin and not 'drag' whilst massaging. The nutritional constituents of the vegetable oil, such as Vitamins A and E, nourish the skin itself. The acid mantle of the skin is the body's first line of defence against germs and is vital to the body's overall health and to the health of the skin. It is formed by a mixture of sweat, sebum, and bacteria unique to each individual. This mantle contains levels in the skin. Massaging with vegetable oils supports this crucial system. Basic Oils: Sweet Almond Oil, Grapeseed oil or Sesame oil are highly nutritious and excellent emollients, extensively used in massage as base oils on its own or for dilution with other specialised or macerated vegetable oils. 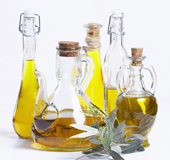 Specialised Oils: These oils are used for their effect on the skin. They are normally used in combination with basic oils in a dilution from 5 to 20%. Avocado oil is a dark green colour and is rich in lecithin and vitamins A and D. It can be used to soothe the skin. It is mosturising to the skin and is ideal for dry, mature skin and assists in the treatment of climate-damaged and undernourished or aged skin. Evening Primrose Oil has been found to be effective for the treatment of eczema and psoriasis, pre-menstrual tension, rheumatoid, rheumatoid arthritis and weight reduction. Wheatgerm oil is a dark orange colour with a strong fragrance typical of the cereal, and contains high levels of essential fatty acids and some vitamin E.
Jojoba Oil (pronounced ho-ho-ba) is unique because the oil is not composed of fat but of liquid wax. When applied to the scalp as a treatment, jojoba oil acts to regulate and remove sebum layer. It is also beneficial in the treatment of certain dry scalp and skin problems such as psoriasis and eczema. Aromatherapy Massage Dublin recommends the use of jojoba oil as it is suitable for all skin types. It is composed of wax esters and is an extremely stable substance, easily absorbed by the skin, best used with almond oil. Rosehip Oil is produced in Chile and is extremely beneficial in tissue regeneration for conditions such as burns, facial wrinkles, and the treatment of scars following surgery. The oil is used to reduce wrinkles and signs of premature aging. Aromatherapy massage dublin recommends the use of rosehip oil for its outstanding skin rejuvenating properties. Infused or Macerated Oils: They are vegetable oils to which other matter, such as herbs, has been added. Base oils commonly used for maceration include almond oil, sunflower oil, and olive oil as well as other food-grade triglyceride vegetable oils, but other oils undoubtedly are used as well. Arnica oil is recommended for external used in injuries in which the skin is not broken such as bruises, rheumatic muscle and joint problems, contusions, haemorrhages and swellings, including bone fractures. Calendula oil has anti-inflammatory properties and vulnerary properties, making it useful for stubborn wounds, skin inflammations and varicose veins. It is often used for treating venous complaints. When applied consistently, calendula decreases the symptoms of varicose veins and venous congestion by inhibiting inflammation, toning tissue, and promoting enhanced blood supply to tissue. Hypericum oil is well known for its antidepressant and mood lifting properties. Studies have shown that hypericin is a potent anti-viral drug, especially against enveloped viruses. It does increase photosensitivity so it should not be used before going into the sun. A carrier oil is applied to the skin undiluted, essential oils, absolutes and other concentrated aromatics can cause severe irritation or reactions in some individuals. A carrier oil is used to dilute essential and other oils prior to application. It carries the essential oils onto the skin. Aromatherapy Massage Dublin caution: The aromatic essence (or essential oils) is the very essence of the plant. It contains its life force, that is to say, its energy. A 100% pure natural essential oil is a 100% active ingredient! At Aromatherapy Massage Dublin, we call for national organic and eco labels to help Ireland realise potential of organic food and farming and legitimate certified organic products. 100% natural essential oil, without any added mineral essences or oils, wholly obtained without solvents by simple distillation or mechanical extraction processes. 100% essential oil (containing only aromatic compounds) colour-free, additive-free, non-peroxided, non-deterpenated and non-reconstituted. Essential Oils should be Botanically and Biochemically Defined - BBDEO. (i.e the botanic family name in latin). Therapeutic grade essential oils are pure, organically grown, pressed without solvents and bottled without additives or chemicals, no colorants - no preservatives - no synthetic fragrances - no mineral oils - no gas propellants - not tested on animals. Under such conditions essential oils should be safe for ingestion and topical application on the body. However, the term therapeutic grade is not regulated so it is important to check the suppliers and sources for certified therapeutic grade oils. At Aromatherapy Massage Dublin we invite you to learn more on organic and labelling. Organic certification for professional organic producers processors and distributors. Certification, the UK's market leading organic certification body, offers unrivalled service, value for money and robust organic standards. Organic Farmers & Growers (OF&G) is a leading UK certification body with a reputation for practical, efficient and friendly service. Aromatherapy Massage Dublin welcomes the ratification of the Institute of Marketecology (IMO) as a new organic certification body operating in Ireland. If you have any questions on certified therapeutic essential oils or would like to order organic essential oils or vegetable carrier oils, plesase fill in the form below. At Aromatherapy Massage Dublin we address your issues and can answer your queries, simply fill in the form below with your question.